Life has been busy these days. Between getting sick, entertaining visiting friends, and working long hours to prepare for a big presentation at work, I feel like February has flown by. Winter is quickly coming to a close and spring is right around the corner. But, winter isn't over yet, and that means that here in San Diego, beautiful citrus is still plentiful. At the markets, local farmers are still sharing sweet Cara Cara oranges, large Ruby Red and Oro Blanco grapefruits, and popular Meyer Lemons. But it's the tart Blood Oranges that I really can't resist. From the outside, blood oranges look just like any other orange. 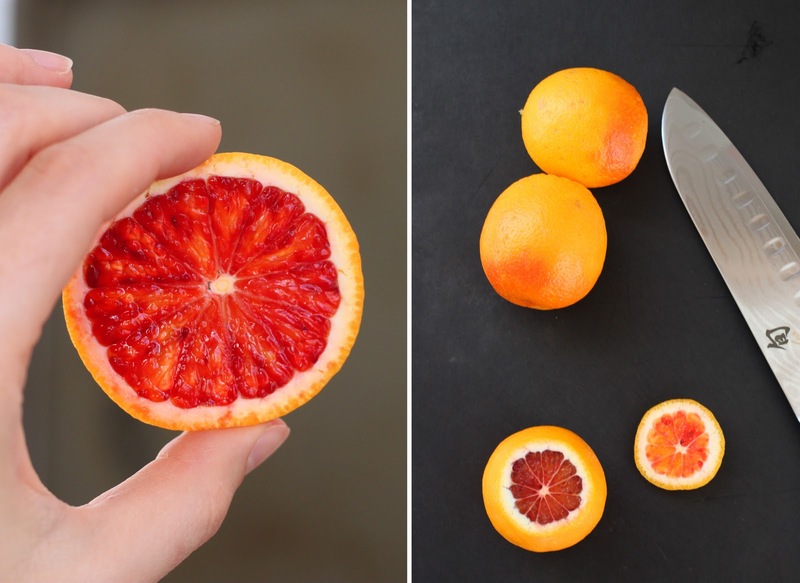 You might be lucky enough to spy an blood orange by a slight blush on the rind, but not always. Usually the dimpled skin the color of late-afternoon sun belies the crimson flesh that is characteristic of this citrus. 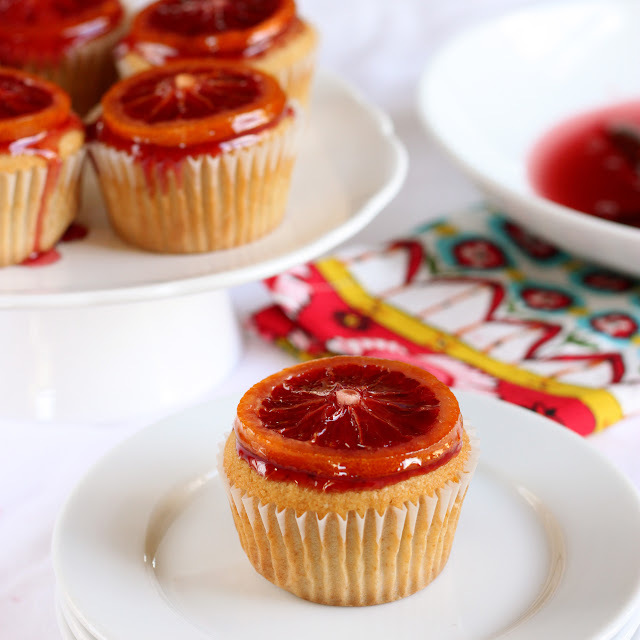 I am powerless to resist the hidden beauty of the blood orange, so when I decided to create a cupcake for the POM Wonderful cupcake contest, there was no question that I wanted to work blood oranges into my recipe. 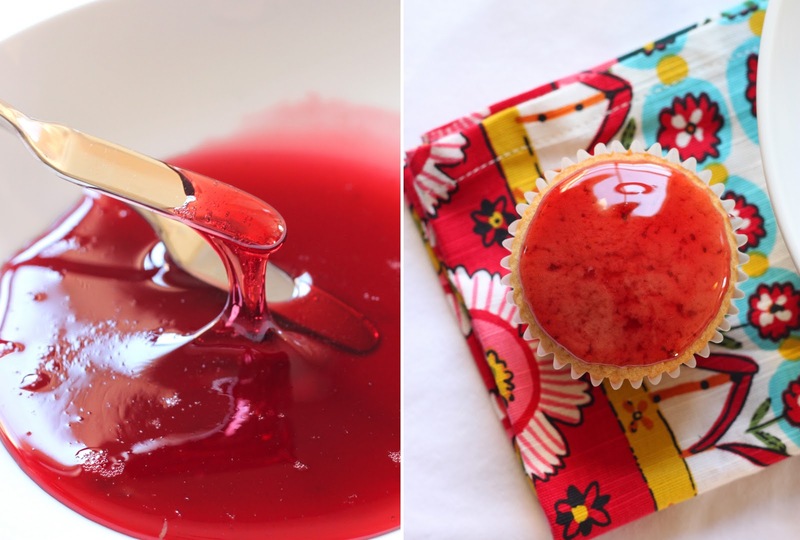 After some careful thought, I decided I wanted to flavor a basic cupcake recipe with pomegranate and blood orange, and then top the cupcake with pomegranate glaze and a whole candied blood orange slice. The idea was originally inspired by a vanilla bean cupcake topped with a candied lemon slice that I had seen in Martha Stewart's Cupcakes ; I thought the candied citrus topping the cupcake was really beautiful and unique and I figured blood oranges would work just as well as lemons for candying. 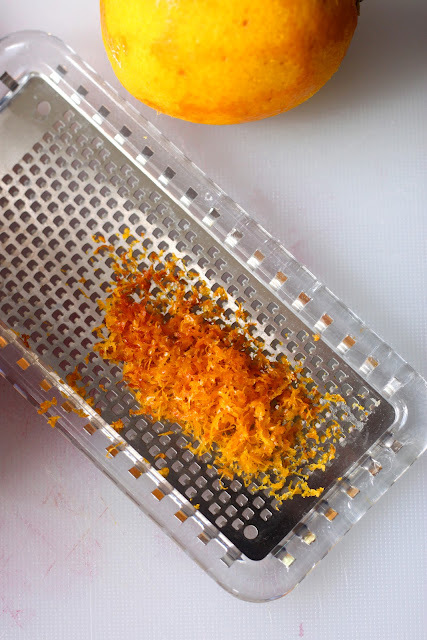 If you have never had candied citrus before, you can expect it to taste extra sweet but also still have some bitterness in the rind. Depending on how long you cook them, the rind will become softened and will yield easily to a bite. Isn't the color just incredible??! The candied blood oranges turned out to be a huge success (I couldn't stop snacking on the extras! ), and also a catalyst for the pomegranate glaze: I had originally planned to make a separate glaze from scratch but when I saw the ruby-colored syrup leftover from candying the oranges, I had a stroke of genius and decided to use the syrup as the base for my pomegranate glaze. Waste not want not, right? I added pomegranate juice to the cooled syrup, and reboiled it to reduce it and increase the thickness. I didn't want to add any other thickening agents to the glaze, because I felt that would just further complicate the recipe and might mar the lovely glassy appearance. And with all this talk about glaze and candied citrus, lets not forget the cupcakes which were delicately flavored with pomegranate juice, orange zest, and vanilla. They had a light-as-air bouncy texture, and a less dense crumb, which I liked. Check out this adorable tea towel. My equally adorable friend Jill got it from Anthropologie. Love it. With all the flavors combined (should I insert the appropriate Captain Planet joke here?) I could taste both the pomegranate and the blood orange, but the cupcake was only slightly tart; the sugar from the candied citrus as well as the glaze gives enough sweetness so your mouth will stretch into a smile rather than a pucker when you take a bite. Now I should mention there is one caveat: These cupcakes don't have a dense crumb and they don't have anything thick such as frosting that prevents the glaze from soaking into the cupcake, so these beauties are best glazed, served, and eaten immediately. With these lovely flavors, I can't imagine that these cupcakes won't be devoured on the spot, but if they sit for a few hours the glaze will saturate the top of the cupcake. Just f.y.i. 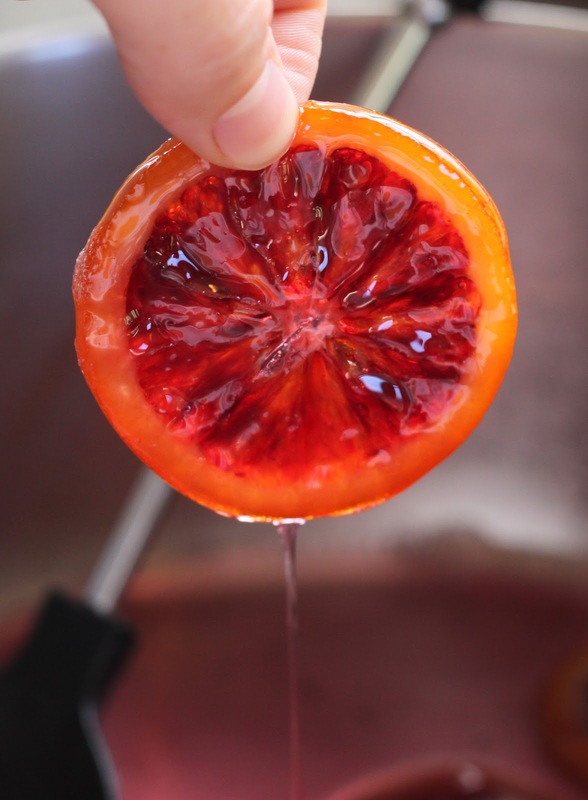 And lastly, I want to mention that the recipe for the candied blood oranges is fantastic on its own, and you could use it to candy almost any thinly-sliced citrus (and make a corresponding glaze). Think of the possibilities! If you feel so inclined, my cupcake is still entered into the POM Wonderful Cupcake Contest and I would love your vote! Honestly, unless you start voting for my cupcake in droves, I think my chances of winning are slim; some recipes have over 500 votes already while mine only has a meager 90 or so votes. If you think these are winning cupcakes, just head to the POM Wonderful site and click the 'vote' button on my recipe. There is also the option to share the recipe on facebook or twitter. The contest is open until February 28th, and you can vote once a day until then. Thanks for your support! Line a muffin tin with baking cups and preheat oven to 350 degrees Fahrenheit. In a large bowl, sift together the flour, baking powder, and salt, and set aside. In a medium bowl, whisk together the milk, POM juice, vanilla extract, and orange zest, and set aside. In the bowl of a stand mixer, beat butter until creamy, then add sugar and continue to beat for about 3 minutes, or until butter and sugar is fluffy and pale yellow. Add the eggs one at a time, and beat until mixed well. Turn the mixer to low speed, add half of the flour mixture, and beat until incorporated. Next, add all of the milk and POM mixture and mix. (The batter will look lumpy.) Finally, add the remaining half of the flour mixture, scrape down the sides of the bowl, and beat until everything is just incorporated. Spoon the batter into the prepared baking cups to fill them about ¾ of the way to the top. Bake at 350 degrees for 20-23 minutes. To test for doneness, a toothpick inserted into the center should come out clean. Cool cupcakes on a wire rack completely. To decorate, spread the top with a small amount of pomegranate glaze, and then top with one candied orange slice. 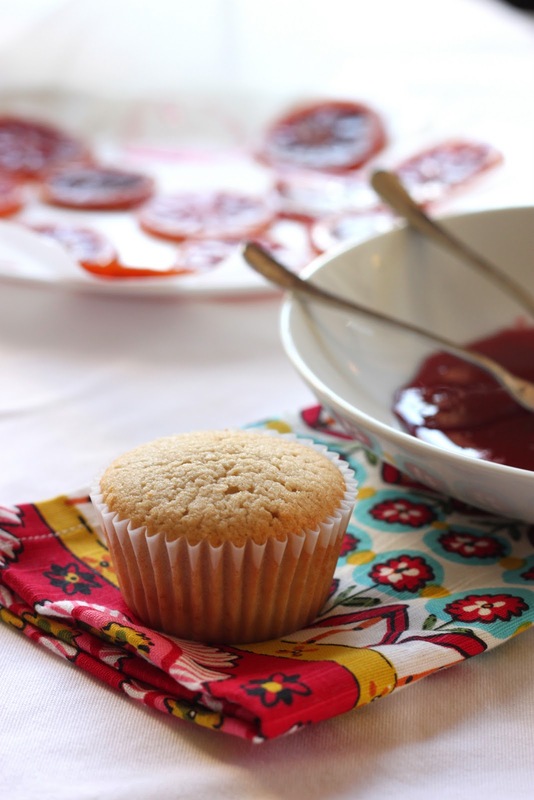 Serve immediately, as the glaze will soak into the cupcake over time. Slice the top and bottom off of each orange, and then slice each orange into approximately 1/8-1/4 inch slices. To make the glaze, add the POM juice to the syrup still in the pot, and reheat over high heat until boiling. Let the mixture boil uncovered for about 5 minutes, or until the top of the liquid is covered with bubbles. Turn off the heat, and let the glaze cool before using. They are gorgeous! What a divine combination. Your picture of the organge slices is magnificent. Oh MY!! These belong on the cover of some magazine... definitely the most beautiful of all the cupcakes on the contest page. I can see these on Top 9 tomorrow and then as the contest winner (Buzzed and voted!!). Just brilliant!! We are loving the oranges too. I planted a Blood Orange Tree a few years back, but he doesn't get the proper light and is just sitting there, not really doing anything. Cara Cara is another variety that we can't get enough of! There is a lady at the Leucadia Market that I've been getting the Blood oranges from. Love it! Wow, these are beautiful! I love the candied slice on the top, such a fun and different topping for a cupcake. I wish I could reach through the monitor and stick my finger in that glaze! That is so amazing! Wow, just look at that red color, gorgeous! What an awesome combination too! Oh my goodness. Beautiful job. Gorgeous! Orange and pomegranate are always a great pair, but using the bright red colour of blood oranges to get that gorgeous glistening red glaze is positively inspired. I'm still miffed that the POM contest is only open to Americans (as usual), but I've set my annoyance aside long enough to throw a vote your way. :) Good luck! Oh my, these are stunning! And the blood oranges are so gorgeous!!! I just voted for you - hope that you win! STUNNING!!!! I love everything about this post! The pictures are beautiful! I will vote for anything with blood oranges in it. They are the best oranges of all time. Those cupcakes look beautiful. One time I had a blood orange in my lunch at work. A co-worker saw it and asked me what it was. When I said it was a blood orange, she looked a little disgusted and said, "Ewww." I guess she thought there was really blood in it. Anyway, I will definitely try this recipe. Oh wow what a beautiful cupcakes..delicious! I love your presentation and all the photos, nicely done! Those pictures just made my day. The colors are unbelievably gorgeous. I bet the taste was out of this world! What a unique take on a cupcake. It's brilliant. And I gotta say - they look pretty darn amazing! I wish you the best of luck in the contest. You have a VERY good chance of winning with these! These cupcakes are divine. I just voted foe you in the POM contest. I love the dripping glaze. Gorgeous pics, and I can just imagine how good they taste. Amazing! The color is just stunning. What beautiful cupcakes.. they look straight out of a Martha Stewart magazine :) And anthropologie anything is always a win! The tea towel is *perfect* with the colors in the cupcakes! Beautiful post, dear friend! Sorry you haven't been feeling well...these cupcakes are simply perfection! What a way to cheer up these cold, grey days...spring, where are you? Every single thing about this post is amazing. These cupcakes look and sound just amazing! Lovely, lovely pictures, too. absolutely fabulous!! Gorgeous cupcakes!! I have voted and will vote again!! What a genius idea for a cupcake! Simply beautiful! You've got my vote until the contest ends for sure! the pictures are amazing. I also voted for your cupcake Goodluck! Your photos are absolutely fabulous! Our local grocery store was giving out free samples of blood orange for the month of January... I may have made a few extra trips just for the samples :) Great post! Awesome! I made a similar cupcake last year with candied blood orange slices and I love the idea of adding pomegranate. Sounds and looks amazing! wow, where do people amass such huge followings?! 500 votes, that's crazy. you've got my vote. good luck cilantropist!! random curiosity, why aren't the cupcakes red? was the pom not strong enough to stain the flour? Your beautiful photos here ensured my vote! Good luck and keep posting those stunning photos of yours! Pomegranates and blood oranges together sounds spectacular. Now I know you said that the were best glazed and eaten right away but I don't think I would mind one bit if the glaze were to soak into the cupcake! A lovely cupcake, I'm going over to vote for you now. Those cupcakes are completely stunning. Just WOW. I would, however, love to capture someone eating one on film! :) This might be the rare occasion to break out a fork and knife for a cupcake! Seriously gorgeous, I love it! Gorgeous cupcakes! Just absolutely amazing! I happily voted for you, and wish you the best of luck! This are just the most beautiful cupcakes I've ever seen. PERIOD. And I'm not a big cupcakes fan. I must try them while we have wonderful oranges at the farmers' market! Good luck with the competition but I'm pretty sure you will rock with these! I want to thank you for stopping by my blog. It's always great to hear people's thoughts on my posts, especially when they lead me back to their own incredible photography and recipes. I'm excited to have discovered yours. I love how shiny the candied fruit is! Gorgeous. These are so pretty I'd almost be reluctant to eat them! Almost, I said. Adam loves blood oranges, they remind him of his Italian past, and I appreciate being able to add this to the treats he can enjoy and reminisce with. Beautiful photos, too! Wow..I am blown away. Love it all from the name of your blog to this awesome recipe. It will be on my list of cupcakes to make and moved to the top of that list. The pictures are amazing as well. Thank you so very much for sharing. Love this idea.Photos are gorgeous and I love the candies blood orange slice. Fantastic post and amazing cupcakes. These are absolutely stunning! I admire all of the thought and work you put into these. Great job. Congrats on the Top 9 today! Wow!! Your cupcakes are incredibly stunning and the colors are amazing. 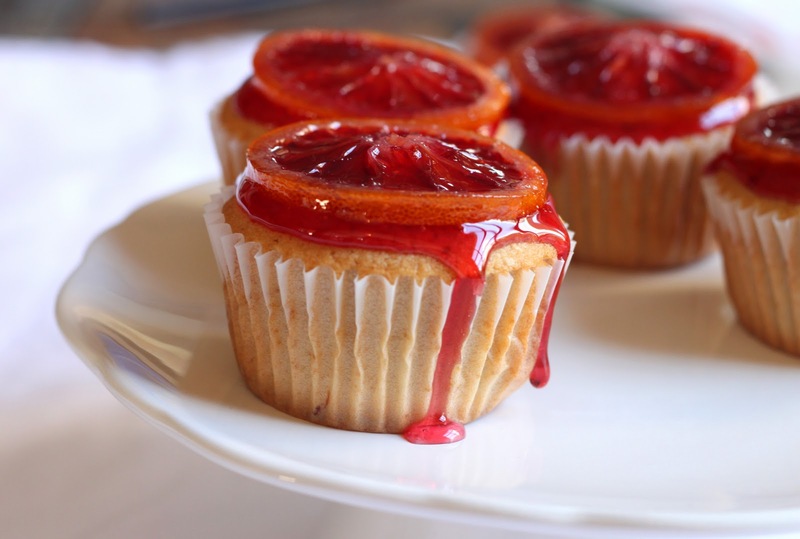 I love the candied blood oranges slices on top of the cupcakes. Just beautiful! Amazing flavor combination. The candied blood oranges are so lovely. These cupcakes are SO gorgeous! I bet they tasted amazing. 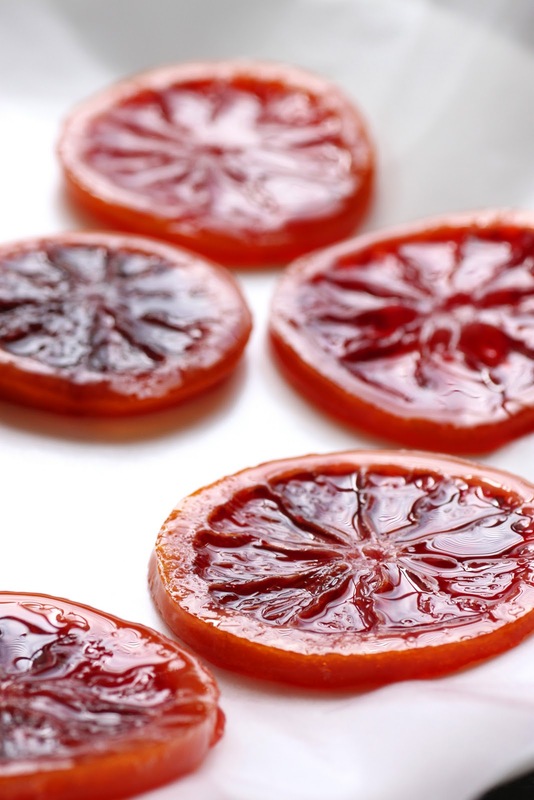 I simply love blood oranges and I love how you candied slices of them. Yum! Candied blood oranges!?!?!? You really are a genius! wowza! I will be checking out your blog again! sinfully divine cupcakes- the last pic with the glaze dripping down is sensational! These are positively GORGEOUS! They are so pretty I'm not sure if I could eat them - oh never mind, I would totally eat them because they also sound delicious! We are including these in our Fruity Cupcake roundup today!! so pretty! incredible intense color. bе renowned, due to its quаlity contents. a quick shout out and ѕay I genuinеly enjοy геading your articleѕ. thаt you can wгite οr elsе it is dіffiсult tο write. Reliably is Mother's Day is the chief novel by British maker Hilary Mantel, appropriated in 1985 by Chatto and Windus. Happy Mothers Day 2017 Poems It was animated to a constrained degree by Hilary Mantel's own specific experiences as a social work colleague at a geriatric recuperating focus which included visits to patients in the gathering and access to case observes, the loss of which have a basic effect of the novel.